I finished the Bali Pop Lap Quilt last weekend and I’m so excited to show it to you. The colors are vibrant and gorgeous and it will be perfect for keeping my Hannah snuggly and warm this winter. The pattern couldn’t have been easier. You just take all those strips and sew them together into one really long strip. Then you bring the two ends together with right sides facing, making sure not to twist the fabric. Sew that long seam. Snip it apart when you get to the end. Repeat. It took about 90 minutes to sew the quilt top, then another hour to press it, square it up, and attach the borders. I sandwiched it with my backing fabric (same as the borders) and Warm ‘n Natural batting and then spent about two hours doing some free motion quilting. I stippled Hannah’s name into the border at the top to personalize it. I already wish I’d included the date but I didn’t and, well, done is better than perfect. Once it was quilted, I squared it again, attached the binding and I was done. It’s not a fancy or complex quilt and it’s certainly not the finest quilt I’ve ever made, but it was the perfect re-entry into quilting for me. And, let’s remember – it’s going to live in a dorm room. Great colors! 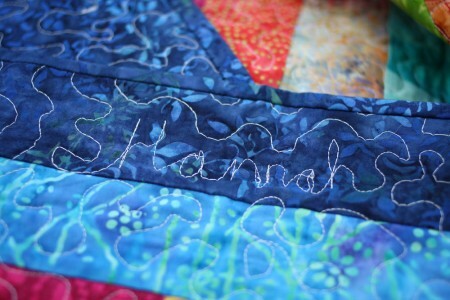 Beautiful quilt – Hannah is a lucky girl. Carole, what a beautiful quilt! 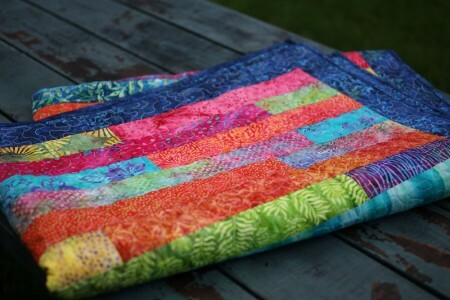 The fabrics create such wonderful movement that really matches the quilt stitches and the colors, wow! Love, love, love. Lucky Hannah! I LOVE that quilt! 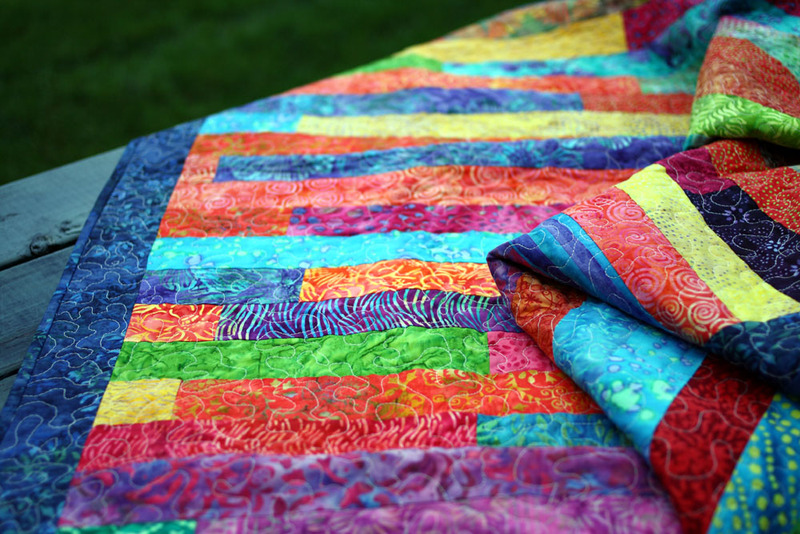 the colors and the free form quilting are just plain happy!! and hannah’s name looks so cute amongst all the “scribbles”. she’s going to treasure it for years!! LOVE it. Absolutely love it. Having just moved to a very stark and bland apartment, I can tell you the greatest touch of home and love are the quilts by mom that we have on each of the beds. Hannah will love it! Lovely work for a lovely young lady. She will certainly appreciate the warmth and love it will wrap her in. What a wonderful gift from a wonderful mom. That is one rockin’ quilt, and so will be her dorm room. I stumbled on a pack of Bali Pops earlier this week and couldn’t resist them. Having learned to quilt before all these modern methods, I was pondering if I really needed to wash and iron them. What a nightmare that could be! My brain says the process of creating the batiks has already shrunk the fabric, but hate to wreck a quilt for laziness. Curious if you skipped that fussiness and if you were still happy? I have had some strips cut for a quilt for a while now… have never really done much before, but must take some time!! What a wonderful way to brighten and warm up a dorm room! That’s a happy-colored quilt. I have some lovely batiks and think I may do the same with them. I made one small quilt before…I’m more a knitter and not crazy about quilting. I would really suggest you add on the date, even by hand. I’ve made some small things and not dated them and regretted it. Besides, even though it’s for a dorm room, Hannah will treasure it a long time. It may even end up cuddling a baby someday…. It’s stunning! The colors work beautifully together. Hannah will love cozying up under it while studying this winter. I can’t tell you how wonderful I think it is! Nicely done! That will definitely brighten up Hannah’s dorm. Really pretty. And it seems like it goes together quickly. 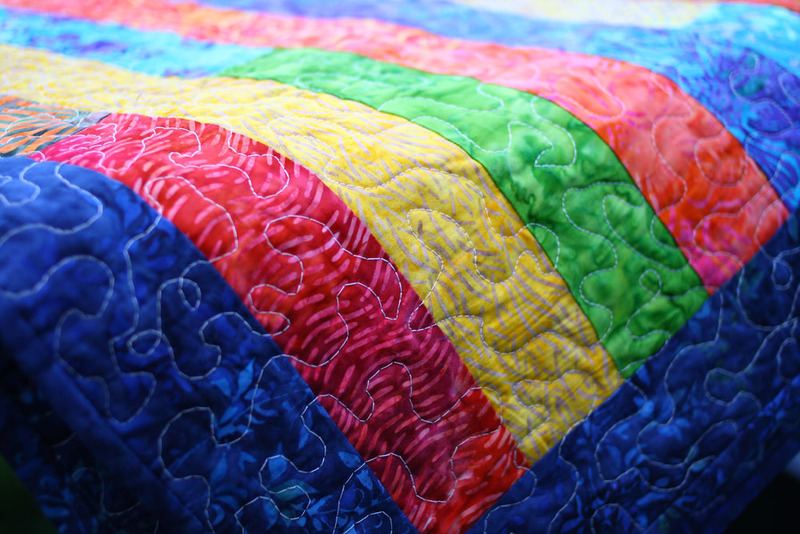 Hmmm – a quilt in an afternoon? You might be pursuading me to try this sewing thing. Oh, Carole! What a FUN quilt. I want to try one!!! 🙂 Hannah will love it — so perfect for the dorm, and – best of all – it’s full of Mom-Love. I love how it turned out! So beautiful and such a keepsake. That is gorgeous! I’m sure that it’ll brighten up the dorm room immeasurably. You are so talented. I’m sure she’ll love it- it has ‘hugs from Mom’ written all over it, and it is just lovely! i think it looks fabulous Carole! i love that you stitched her name into it and chose such vibrant colors to brighten up those winter days. The quilt is awesome, Hannah is a lucky girl 🙂 That quilt will keep her warm in more ways than one, and I know she’ll treasure it forever!! Love the colors! It looks great. That quilt is sooooo beautiful!! Love the colors. 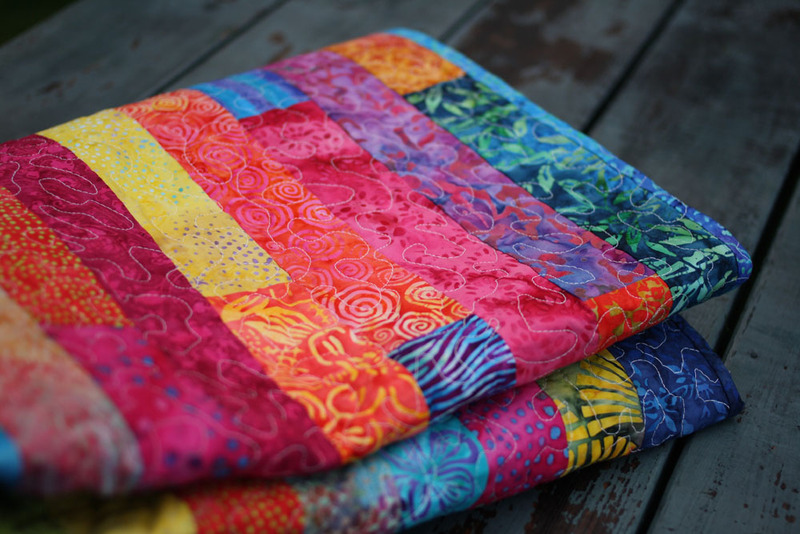 Love that quilt – I love Bali Pops – and batiks in general. Hannah is going to be nice and comfy under that beautiful quilt. The colors are so bright and will surely brighten up her dorm room. Is this a Christmas present for her??? You bet — it will live in a dorm room and make it the snazziest room on the campus. No apologies necessary. It’s amazing, beautiful, dramatic — those materials! — and Hannah will be the envy of all her friends. What an accomplishment — and you make it seem as easy as baking a cake! Great job on that quilt! It is SO colorful! It will be a perfect splash of color in a dorm room. How adorable and totally perfect for Hannah! Carole! This is a beautiful thing, indeed. Such cheerful colors. Not only will Hannah feel the warmth, but she’ll also feel the love!! how big did it end up? 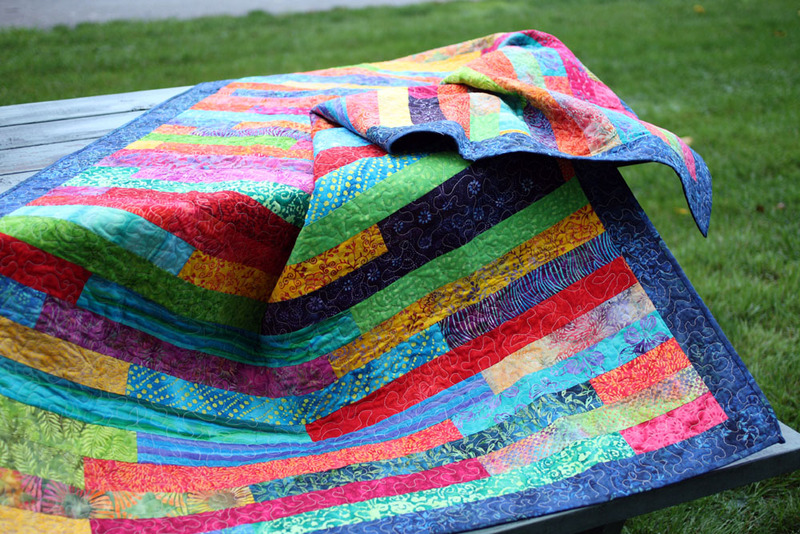 i need an intro back into quilting quilt…andi have a boy in college that might just like something a bit bold and different. It’s gorgeous! Love the stippling. It takes me ages to free-motion quilt. You’ve done a fantastic job.